Roller Blinds for Single Studio Type Pad – Tomas Morato, Q.C. Real wood blinds is considered the pricier type of blinds due to the very nature of its material and fabrication techniques. The authentic nature of its material makes it one of the rare blind type that you’ll see in common home or offices. It is also one of the most sophisticated blinds in terms of mechanism since it contains a lot of moving parts to support the weight and protect the wood slat from bend and sway. 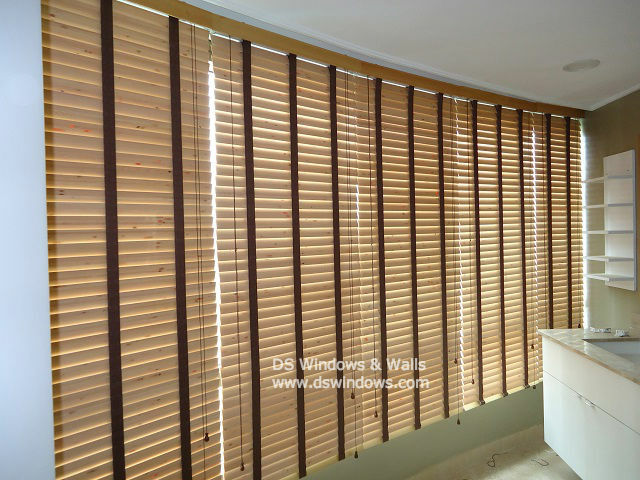 For the more sophisticated customers real wood blinds is for you. Real wood blinds is operable using two functional ropes. Like that of the traditional venetian blinds, one pair of rope is used to pull the wood slats up or down so that when you want to open the blind all the way up, you need to pull the rope until all the wood slats gathers on the top. Another pair of rope is used for slanting the wood slats open or close. Some of the available colors of real wood blinds are white, oak, cherry, walnut, ebony, chestnut, mahogany to name a few. You can also add a cloth tape ladder to give the wood blinds a two-tone color and add design to the overall appearance. Address: 401-A M.G. Bldg., 150 Amorsolo St., Legaspi Village, Makati City. 4th Level Waltermart Makati – Arnaiz Ave. (Pasay Road) cor. Chino Roces Ave. (Pasong Tamo) Makati City. 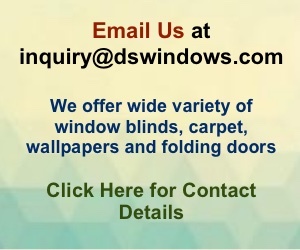 Visit our site for the latest trends in interior design products like window blinds and shades, carpets, wallpapers, and folding doors. Call us at 403-3262 or 893-1373 for free measurement and quotation.